More teens are choosing alternatives to traditional summer jobs – lowering the minimum wage won’t change that. Traditional summer jobs are losing luster as teens pursue better opportunities elsewhere. But will lobbyists use historic lows in teen employment to lead a new attack on Washington’s minimum wage? The drop in teen employment, steeper than for other age groups, is partly a cultural shift. More youths are spending summer months in school, at music or learning camps or in other activities geared for college. … (And) older workers, immigrants and debt-laden college graduates are taking away lower-skill work as they struggle to find their own jobs in the weak economy. Today’s teens and twenty-somethings can do the math: a minimum-wage job isn’t a great gig. And in many cases, they’re watching their own (and their friends’) parents weather a really tough recession. Is it a surprise they’re forgoing a tiny minimum wage paycheck in favor of long-term career building? 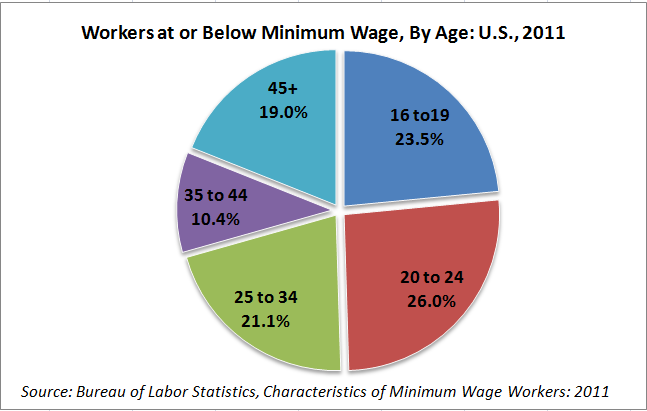 But while teens make up less than one-quarter of minimum wage workers (more than half are over age 25, and 3 in 10 are over age 35, according to the Bureau of Labor Statistics), they’re a far more sympathetic group than longtime minimum wage opponents like the Association of Washington Business, Washington Restaurant Association and the Washington Policy Center. Perhaps that explains why those organizations are (coincidentally) partners in the just-launched Community Forums Network, which itself is (no doubt coincidentally) spotlighting youth unemployment, by (quite coincidentally) juxtaposing it with Washington’s minimum wage. Mainstream economists have long demonstrated high teen unemployment has more to do with increased competition from older workers than the minimum wage (see studies from MIT, UMass, UC Berkeley, and the BLS). In fact, among the 18 states with a higher-than-federal minimum wage, 7 have youth unemployment rates below the national level, 3 are within 1 percentage point of it, and 8 (including Washington) are above. Instead of flogging cheapskate economics and trying to cut the minimum wage, business lobbyists (and Washington’s legislators) would do better to promote the American maxim of an honest day’s work for an honest day’s pay. They’d be rewarded for it: the most recent and economically sophisticated studies (which consider regional variation and long-term economic trends) found that a higher minimum wage not only results in better earnings for all ages, especially for teens in restaurants – it also results in substantial drops in costly job separations and turnover.